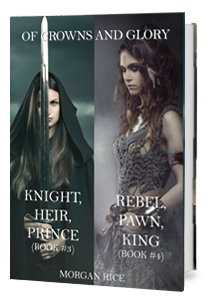 A bundle of books 3 and 4 in Morgan Rice’s new #1 Bestselling epic fantasy series OF CROWNS AND GLORY (KNIGHT, HEIR, PRINCE and REBEL, PAWN, KING). Here are two bestselling novels, all in one convenient file. Over 120,000 words of reading, all for an incredible price—it also makes the perfect gift! In KNIGHT, HEIR, PRINCE (Book #3), 17 year old Ceres, a beautiful, poor girl from the Empire city of Delos, finds herself alone at sea, drifting towards the mythic Isle Beyond the Mist—and towards the mother she never met. She is ready to complete her training, to finally understand her power, and to become the warrior she was meant to be. But will her mother be there to greet her? Will she teach her all she needs to know? And will she reveal all of the secret of Ceres’ identity? In Delos, Thanos, thinking Ceres is dead, finds himself wedded to Stephania, and immersed deeper in a court he cannot escape from and in a family he hates. He also finds himself in the midst of the erupting Revolution, which culminates in a daring attack on the Stade.He is stuck in a game of pawns and kings, of traitors and queens, and it may be Ceres, after all, who is destined to change it all. In REBEL, PAWN, KING (Book #4), Ceres wakes to find herself imprisoned. Her army destroyed, her people captured, the rebellion quashed, she has to somehow pick up the pieces after being betrayed. Can her people ever rise again? Thanos sails for the Isle of Prisoners, thinking Ceres is alive, and finds himself in a trap of his own. In his dangerous voyage he remains tormented by the idea of Stephania, alone, with his child, and feels torn over his life’s path. Yet as he struggles to return to Delos, to find both of his loves, he encounters a betrayal so great, his life can never be the same again. Stephania, a woman scorned, does not sit idly back. She turns all the power of her fury on the ones she loves the most—and her treachery, the most dangerous of all, may be what finally brings the kingdom down for good. Of CROWNS AND GLORY tells an epic tale of tragic love, vengeance, betrayal, ambition, and destiny. Filled with unforgettable characters and heart-pounding action, it transports us into a world we will never forget, and makes us fall in love with fantasy all over again. Book #5 in OF CROWNS AND GLORY will be released soon!